He has been touring all over Europe for years, most often in Germany and Poland. There is frequent opportunity to attend a concert of his. Ray offers a range of formats that usually mix Genesis classics with his own songs. Song For A Friend and Makes Me Think Of Home are his most recent studio albums, both of which came out in 2016. Since then he has showcased many songs from these albums live. 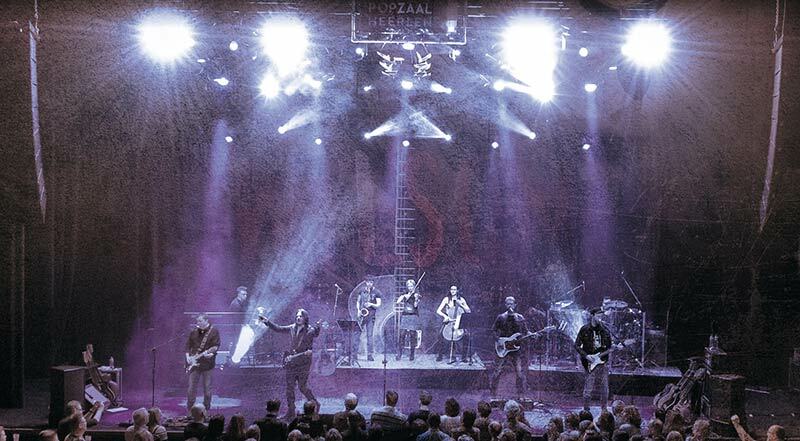 The upcoming 20th anniversary of the release of the Genesis album Calling All Stations prompted him to include more songs from that album in live set – particularly those he has played rarely or not at all. 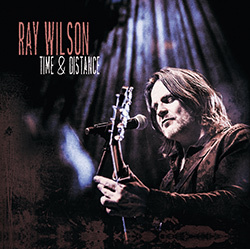 It was during this time that he recorded his new live double album Time & Distance that goes on sale on September 29, 2017, though it can already be bought from the shop on Ray’s website. Time & Distance comes in a Digibook, like his most recent studio albums. The booklet shows many photos from the show. The release begs the questions whether there is any added value to Time & Distance when compared to the 20 Years And More set that came out three years ago. Time & Distance is a pure live album, it does not include a concert film like 20 Years And More, and Ray has spread the material on two CDs. The first disc has the Genesis songs, and, yes, there are a couple of overlaps: Congo, Mama, Ripples, Calling All Stations and Carpet Crawlers are on both the new and the old release. The new album has The Dividing Line. This is probably the biggest surprise as well as a major fan dream come true. Add to this Home By The Sea, Entangled, Follow You Follow Me, a band version of Not About Us and Peter Gabriel’s In Your Eyes and Another Cup Of Coffee by Mike + The Mechanics. The second disc has only songs from Ray’s solo career and his non-Genesis projects. There is only one overlap here, Another Day from the Cut album Millionairhead. Ray has dug out two fan favourites: the ballad Alone (from The Next Best Thing) and Propaganda Man, which has been particularly well-received live. Then there is Bless Me from Propaganda Man as well as First Day Of Change and Ought To Be Resting from Unfulfillment. The other songs are from his most recent albums: Song For A Friend provides its title song, Old Book On The Shelf and Not Long Till Springtime while Makes Me Think Of Home brings Calvin & Hobbes and its title song. The final song is Take It Slow from Chasing Rainbows. There is an added value, based on the tracklist alone. The album has great artwork and is a good presentation of his current shows. Musically he has developed even further in places. Take It Slow sounds great, much more fluent than in the beginning. Ought To Be Resting is a live smash hit. And finally he has brought in THE Calling All Stations song that was so very overdue – The Dividing Line. It is played more or less in the guitar battle version from the 1998 Genesis tour, and it sounds excellent. This number offers much space so that it can sound different every night. The Dividing Line is probably the song from the last Genesis studio album that indicated best where that line-up could hve gone. Home By The Sea is one of the Genesis live staples; it, too, was played in 1998. This time, however, Ray has cut out the instrumental section and plays it as a brisk rock song – which is great, but of course you might have liked to hear the instrumental, too. Follow You Follow Me and Not About Us are played by the whole band, which is a rarity in Ray’s set. In Your Eyes and Another Cup Of Coffee are very uplifting, but sort of expendable. Congo, on the other hand, is fast becoming a highlight of his shows. Where the solo material is concerned, Alone and Propaganda Man stand out as huge re-discoveries. Propaganda Man in particular, which sounded clumsy in the live version (as if Ray had had no idea how to do it) really grows live, and Ali Ferguson plays a great solo on it. The band has found their feet in Take It Slow so they can really enjoy the song. Another big winner. Makes Me Think Of Home is as impressive live as on the album. When he played that at the Night Of The Prog Festival, I overheard someone say “Hey, Ray can do prog after all”. Indeed, it is a fine mixture and Makes Me Think Of Home is Ray Wilson’s first long prog song. Everybody will need to make up their minds whether Calvin & Hobbes and Not Long Till Springtime are the best choices from the newest songs. The reviewer does not think so, for many other songs on the new albums are more exciting and would have merited to be included in this live album. However, Ray has a special relationship with these songs, so the choice is understandable. Song For A Friend is a must on this album. It is arguably the most important song Ray has written in recent years. Bless Me and First Day Of Change bring the album to a solid end with excellent arrangements. Time & Distance is a good package with a number of highpoints – and a great addition to 20 Years And More.